Great writing can connect with your audience, so it’s only natural that you should be gearing your updates toward the audiences on your social media platforms. 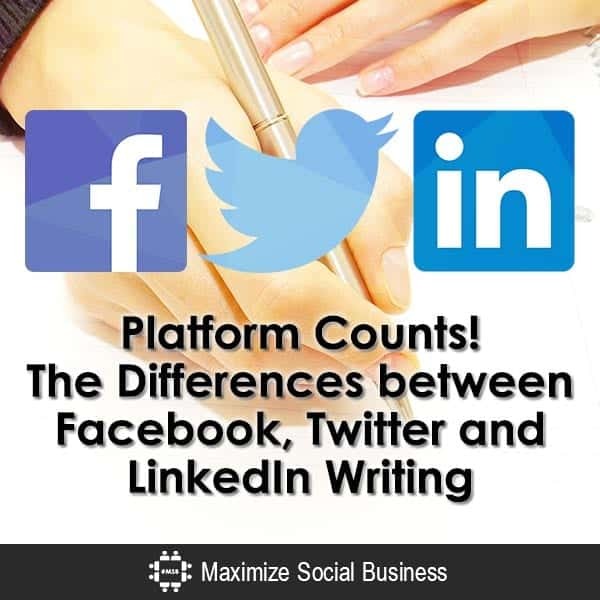 Even though Facebook, LinkedIn and Twitter tend to get lumped into the same general category of marketing, they are actually quite different. The audiences and the platforms call for slightly different types of writing. This is one of the biggest reasons to avoid posting the same updates across the board. Marketers like to save time but crafting one update for Facebook, LinkedIn and Twitter can make your social media marketing efforts fall flat. Does this mean that you need to go out and find (or create) three or four separate resources to share each day? No. But it does mean that you need to take the time to customize your writing style to your audience. Here’s a real live example of how I did just that with my colleague Joellyn Sargent’s recent post about social media and B2B Branding. Using the Buffer tool, I’m able to schedule multiple updates for platforms but still maintain the option for customizing each update. By now, the 140 character limit for Twitter updates has been burned into everyone’s brain. But this isn’t the only rule for clickable Twitter sharing. You need to have a hook to capture your follower’s attention and entice them to click through to read the article. This is important whether you’re sharing your own resources or you’re sharing someone else’s. Consider using a line from the article itself rather than the title. Although in this case, the title of the article is very good, it may not always be the case with every story you want to share. Finding an actionable, interesting line in the blog post – or summarizing the main thesis – can draw your followers in. As an added bonus, creating your own Twitter update for a curated blog post can help you stand out from the pack. How many times have you seen the same title from Neil Patel or Mari Smith tweeted over and over again? Don’t be a sheep – find something else to share from the story. I know that I have a lot of B2B followers on Twitter because that’s who I’ve networked with, so I make sure this version of the update includes the B2B term to attract attention. I also turn #B2B into a hashtag to attract some more potential followers in my niche. Note that the update itself is under 100 characters. I have a long Twitter handle, which used to be even longer before I truncated my last name. In order to make re-tweeting as easy as possible, I try to keep updates around 80 to 90 characters tops. Keep this in mind when you’re crafting your own Twitter updates. Keep your update under 90 characters. Craft your own clickable headline if possible. Use popular hashtags that relate to the update *and* your target audience. With Facebook, your personal profile updates may be more casual, but when it comes to posting on your company’s page, you need to take a whole different approach. Your page updates need to be well-defined and geared toward your businesses’ audience. In my case, my Facebook business page has attracted a lot of solo and very small business owners, both in the B2B and B2C industries, based on networking that I did very early on. Many of them are not in my B2B target audience, so my Facebook update is a little more general. 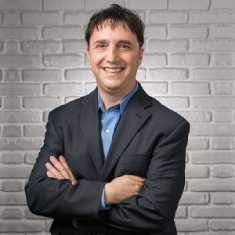 I want to brand my Facebook business page as a good resource for SEO, content and social media advice. Plus, sharing a post that is B2B oriented may encourage sharing from by B2B audience which can bring in more B2B fans on Facebook. Facebook allows longer length updates than Twitter, so take advantage of this. Ask a question on your Facebook page in order to build community and get people talking. The image selection is also important. In the case of this post, the suggested image was black and white, so I opted to display the eBook offer which was a bit more eye catching. If a post doesn’t have an image, you can upload one yourself to make the update stand out. Match your update tone and focus to your audience. Ask a question or encourage discussion on your page. Always feature an eye-catching image (upload one if you have to). Like Facebook, LinkedIn offers a longer post length so you can create more insightful updates than just a headline and some hashtags. However, since the audience is exclusively business oriented, it’s important to keep that in mind when you’re crafting your updates. Business readers are pressed for time – which I’m sure you know from firsthand experience. You’ve got to get to the meat of the post as quickly as possible. Your updates appear in a Twitter like feed only when a LinkedIn user visit the homepage, so it’s important to capture attention. The LinkedIn audience is most definitely a B2B audience, so in this update I can really highlight the nature of the post, call them directly out with a question and encourage them to read on for more. Once this Buffered post is live on my profile, I’ll share it with a few key groups but edit the update a little more. Don’t you hate it when people post updates to a group that they are clearly spamming everywhere they can? Don’t be that person. 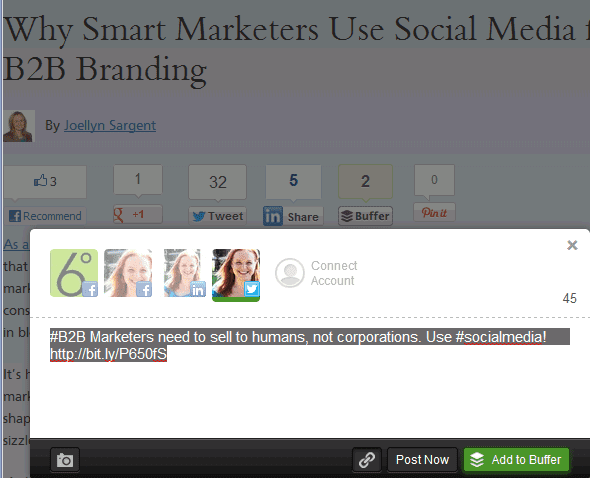 If you’re posting a B2B update to a small business networking group, don’t speak to B2B marketers. It’s as simple as considering your audience and making a few changes in words and tone. Highlight an actionable tip from the post. Ask questions to encourage conversation. Tailor the update to groups where you are sharing. Like all marketing, and social media marketing in particular, these aren’t hard and fast rules. You can experiment with your own followers on each platform to see what works best. Your turn! What are your favorite writing rules for social media platforms? And how do you approach Google+ updating? Courtney Ramirez is an expert in Social Media Writing. Courtney is the Director of Content Strategy for Endurance Marketing, where she helps take B2B brands from boring to breakthrough. She creates strategies that helps businesses tell their story, increase their prospects and convert more customers. She manages content marketing creation and implementation so clients can see the best results from their inbound marketing efforts. She geeks out on content marketing metrics and cat memes. 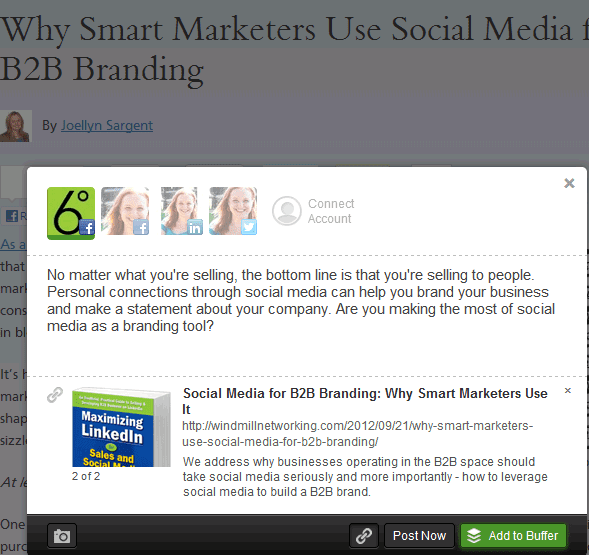 Hi Courtney, great post…and thanks for using mine in your case study! Like most of us, I get lazy at times so this is a wonderful reminder to make the time to target for my audiences on each social network. Thanks for the comment Warren! I find being myself and taking note of the friends/associates I have on each platform and what they’d be interested in is a great combination. Very insightful. I have been concerned with posting the same blog update across multiple LinkedIn discussion groups, as it can certainly look like spamming even if the posts are useful. Do you have a suggested pace for posting on LinkedIn within the same group? I totally agree with what’s this article says – the example is a great way of getting the point over. Does anyone know of a good article on the most time efficient procedure for using Buffer and Hootsuite to do what this article recommends – I don’t believe in reinventing the wheel when not necessary? It’s why I am scared to use LinkedIn, I have an arts & craft business and many of my followers do to but I don’t want to be spamming them with my personal blog etc… I’ve done it a couple of times for exciting news but felt funny about it. Do people on LinkedIn really want to know about the craft shows I am going to? Thank you for the tips. I would think that if most of your LinkedIn followers were also in the arts and crafts niche that they would be very interested in any craft shows you were attending, especially if you “crafted” the post as an FYI or other helpful tip or thought. I agree with KGB Diva, Megan. If your followers on your LinkedIn profile are in your niche, why not share which shows you’re attending? This way they can meet up with you if they happen to be there. If you’re nervous about posting from your personal blog, you could try creating a crafts business only blog – I’m sure your fellow crafts business owners would love to hear your tips for making the most of a show. Hi Courtney, you are correct. I used Hootsuite to post a same message across all platforms. But after realized that the conversion rate is very low, I changed my way to develop message. As you said, I customize (the right human tone) to different platforms. 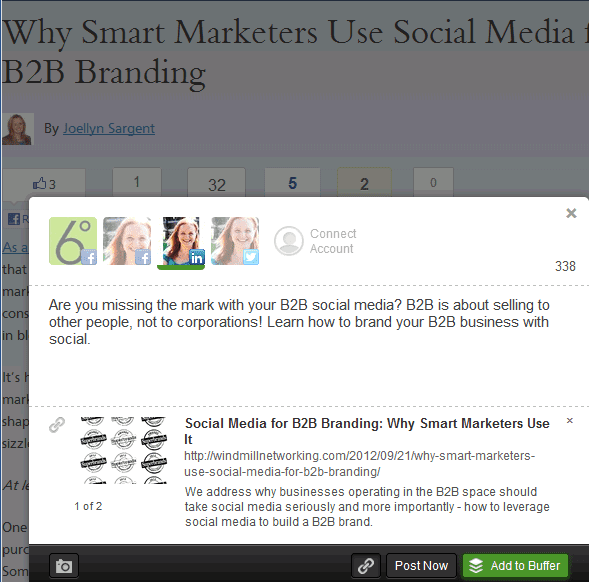 Customizing is a great way to make the most of tools like Hootsuite. Glad you enjoyed the article! This is a good post, Courtney. Syndicating the same status updates across all social networks is definitely not the way to go unless you have too little time and you see social media as a not-so-important marketing channel. Just to add on to your tips on Facebook status updates, it is important to note that since many Facebook users are now browsing the platform via their mobile phone, we should consider to limit our updates to less than 160 characters so that they don’t get cut off behind a Read more… link. Thanks for the tip Wayne! 160 characters is a good rule of thumb for Facebook.